Paper Man: a Machine Created by Arduino and NFC. Create your own Super Bright LED sneakers that blink with multiple patterns. Measure the circumference of your sneaker. Add 6 inches to that figure and cut two strips of Sticky Back Velcro to length. Put aside the “loop” side of the velcro for now. Cover the sticky side of the “fuzzy” velcro strip with electrical tape. Remove the backing from the fuzzy piece of velcro (it’s very sticky!). Carefully attach electrical tape (sticky side to sticky side) to the velcro. This is going to be the exterior backing for the LEDs so make it look smooth. Do it slowly so you don’t make any wrinkles. I used long strips and overlapped them to cover the entire area. Trim off any excess with a scissors. 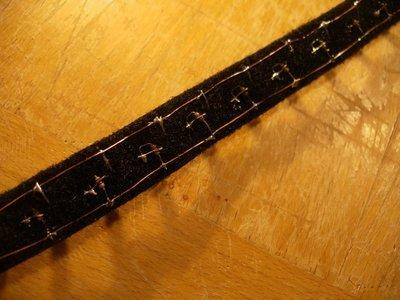 Use a ruler and a sharpie to mark off 3/4″ segments on the electrical-tape side of the fuzzy velcro strips. Take your poker (pin, awl, etc.) and poke two small holes on each side of each mark. This is where you will thread your LED through later on. Make the holes about 3/16″ apart. I used the pointy side of a circle cutter to make the holes and then later re-poked them with a pin to make the holes bigger. You probably have a better tool than mine to get this done easily. Before inserting…check each LED to make sure it’s working! I quickly checked mine with my breadboard + Arduino. My LEDs came from Ebay. You can get packs of 100 super bright LEDs for a few bucks. My sneakers each needed 35 LEDs, so 1 pack was plenty for one pair of sneaks. Poke each LED through the holes you just made. I chose to orient them so that the negative (shorter lead) was on the top when holding the velcro strip vertical. 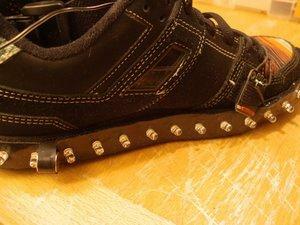 Insert enough LEDs to wrap around the entire shoe (remember you have some extra velcro on the end). Once all the LEDs are in, bend the negative leads to the left, flat against the fuzzy stuff. 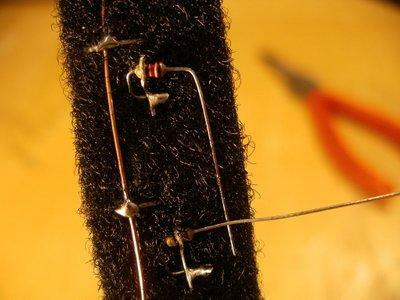 Using your 24 gauge bare wire, solder all of the negative leads together. Leave a few extra inches of wire at the end. Clip the excess from each LED. I bought a pack of (100) 120 Ohm, 1/8W resistors on Ebay for a few bucks. I devised a way to attach the resistor to each LED to save space and keep it in place. You can experiment with what works for you, but I ended up tucking the resistor underneath the positive lead of the LED (see photo). 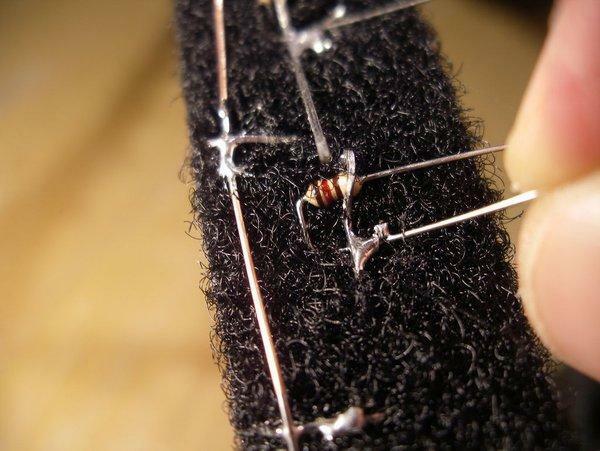 Use pliers to bend each resistor to the shape in the photo. Bend the positive lead of the LED so that it creates a space for the resistor to fit underneath. If you make it snug, it will pinch the resistor a little so that it stays in place. I found it helpful to insert a few resistors, then solder them in place. Even if you bend everything perfectly, it’s hard to work with the resistors poking out the side. Solder the positive lead of each LED to its corresponding resistor. Clip the excess when finished. Grab your 24 gauge bare wire and solder all of the resistors together. Remember to leave a few inches of extra wire at the end. This wire is going to connect to a PWM pin on the RBBB Arduino. Look over your solder joints carefully. Fix any that look weak or disconnected. Some solder may have leaked onto the fuzz (you can pick it off if you want), just make sure you haven’t created any unwanted connections. Plug the strip into a breadboard to test the LEDs. I used a spare Arduino with a simple Blink sketch. With the extra wire on the end, it’s easy to plug these into GND and a PWM pin. If you have an LED that isn’t working, look over your connections. Check for bad solder joints. If everything looks fine you may need to replace the LED. It’s not a big deal. Clip the leads and insert a fresh one. Re-solder all connections, check and test until all LEDs are working. 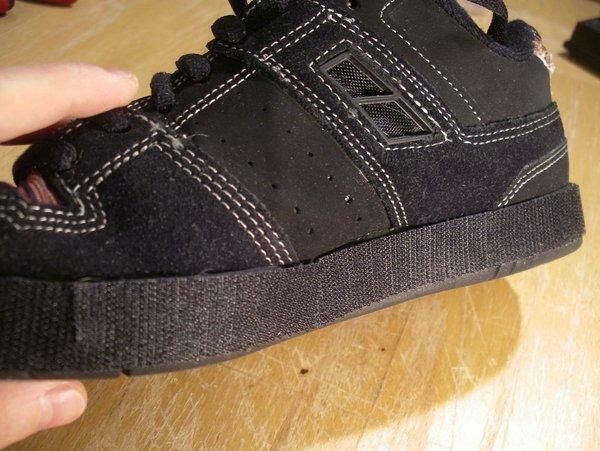 Depending on your sneaker, you may need to cut your “loop” velcro into smaller sections. I found it helpful to cut mine into two segments to get around the curves of my C1RCAs. Leave about 1/8″ of space from the bottom of the shoe. It’s probably a good idea to make sure the sneaker is clean so that the velcro sticks! If you buy a kit version of the RBBB you’ll have to put it together. Actually you should buy two (one for each sneaker). Put these together now. Leave off the DC connector. I really wanted to keep this project small so I opted to try a 6V, barrel shaped battery (Duracell 28A medical battery). I couldn’t find a battery holder for it, so I decided to mod a AA battery holder. With a small hand saw cut the middle out of the AA battery holder – about 1/3 from each end. Chuck the middle piece and sand down the seams of the other pieces. You will be putting these ends together. Measure and use common sense so that you don’t make it too small or too big. Check often against your battery. Epoxy these two pieces together. I used a spare chunk of thin plastic to help secure it. Epoxy the two halves onto the plastic base. Repeat for the 2nd battery holder. Insert a slide switch into the wiring on your battery holder. I inserted mine on the black lead. Solder the red and black leads to the RBBB on the back of the PCB, just above the two fat capacitors that are on the other side. Flip the switch and make sure the green LED lights up on the RBBB. Use an FTDI cable to upload a simple sketch to test out the board. Don’t forget to remove the battery if you are using USB power. Once you’re done testing, upload the SuperBriteLEDSneaker1_0 sketch to your RBBB. Place your strip loosely on the sneaker (don’t clamp down on the velcro yet). Make the ends come together at the back of the shoe. You should have some excess velcro which we will use later. For now, keep the strip on the shoe so you can install your Reed Sensors and Magnets. After experimenting with Hall Sensors, Reed Switches and Reed Sensors I decided that the Reed Sensor was the best for activating the switch that changes the LED pattern. Both the Hall Sensor and Reed Switch didn’t work well because they needed very close contact with my magnet (1-2cm) and that was too close. I didn’t want to have to be that careful or even bash my LEDs together by mistake. The Reed Switch would also occasionally get stuck and the glass breaks very easily. I got two Reed Sensors on Ebay. A magnet will activate the switch up to 3cm away. The plan is to install one at the toe end of one sneaker and the other at the heel end (with corresponding magnets to trigger them). So each sneaker has one Reed Sensor and one magnet. On my left sneaker I installed the Reed Sensor at the inside, toe end (about 4 inches from the shoe tip). Your Reed Sensor may have come with wiring attached (great!). Solder a wire from GND on the RS to the ground wire on your LED strip. (Modify the length as needed for the GND connection.) You can pull off part or all of the LED strip in order to do the soldering. Thread the other two wires from the RS (for PIN and 5V) through your shoe laces. These wires will terminate at a place near your ankle once the other hardware is complete, so for now just make sure there is enough wire to reach with a bit to spare. Similar procedure for the right sneaker, but place the Reed Sensor near the inside, heel end. At this point it might be helpful to put a small square of velcro to secure the Reed Sensors in place. Check the circuit diagram for where to make connections to the RBBB Arduino. LEDs go to PWM Pin 9 (D9) and GND. Reed Sensor goes to 5V and Pin 2 (D2). To complete the hardware connections I decided to get some servo wire and connectors so I could customize the length of wire for a perfect fit. I also wanted to have the ability to detach my RBBB and LED strips from the sneakers. Once I cut the wire to length and crimped the connectors, I trimmed off the excess wire from the LED strips and soldered the servo wire to it at the back/heel end of the sneaker. The idea is to make the LED strip one component that will plug into a connector that is attached to the RBBB. Same idea for the Reed Sensors. Plug in the LED strip and Reed Sensors to the corresponding connectors. Upload the SuperBriteLEDSneaker1_0 sketch to your RBBB Arduino if you haven’t already done so. Power up the RBBB. The LEDs should light and begin fading up and down. Grab a magnet and bring it close to the Reed Sensor. The pattern of LEDs will change to a slow blink. Remember to pull the magnet away unless you want the programs to change quickly. You can program your own patterns as you desire. Notice that the Reed Switch is connected to an Interrupt pin. Position both sneakers so that they are lined up next to each other. Note where each Reed Sensor is located. On the opposite sneaker, install the magnet so that when the two sneakers are brought together they will trigger the Reed Sensors. The magnets I used are cylindrical and axially oriented, so they work best when the round side is brought close to the Reed Sensor. I used electrical tape to make a little sling that I wrapped around the magnet and attached to the velcro. Make sure that the magnets are secure. Firmly press the finished velcro strips onto the sneakers. Gently bend any LEDs that are not lined up neatly. Put on the iPod Nano arm band (on your ankle) and see how it fits. I trimmed the straps and added velcro for a custom fit. Connect up all components to the RBBB and insert it into the pouch. Power both units up. You will see the fade up/down pattern. Start getting a feel for how to change programs by bringing your feel close together. Make sure to align each magnet with each Reed Sensor. It may take a little practice to learn how to change programs. Make adjustments to the magnets and/or Reed Sensor locations as needed. Because these are super bright LEDs, these babies look incredible in the dark and are especially eye-catching outside at night. With the modular design, you can use them on more than one pair of sneakers (just attach more loop velcro to your other sneakers) or for other wearable projects. Have fun!